386,509,752 Hits made | 7,655 Today. 263,179 Members 15 New Today 48 Online. 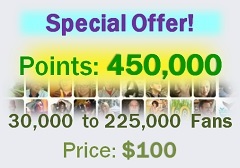 After your purchase, Points will be added in less than 8 hours. We operate on EST, if your order comes at night it can be delayed. We delivered 250,000,000 Fans with 200,000 Real Likers! Please LOGIN First Before Buying. We accept Perfect Money, OkPay and bitcoin. Contact us for details!